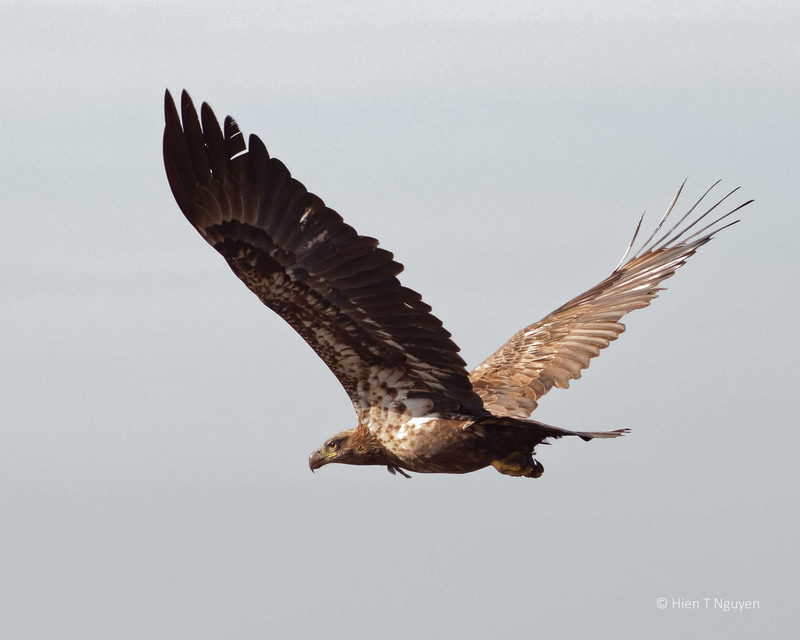 This morning was cloudy and windy, but I went to the refuge anyway, and among the many birds and ducks I saw a young Bald Eagle who put on an impressive flying exhibition. 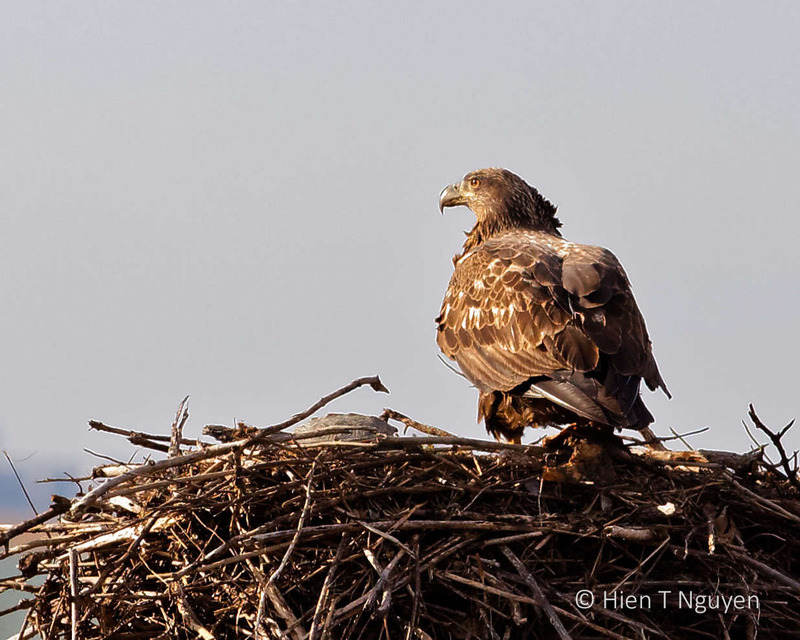 Young Bald Eagle on Osprey nest. The Ospreys had migrated South a month or so ago. People in several cars were trying to take its picture, so the Bald Eagle took off. It looked as if it was preparing to dive. But it just banked and flew away. Here’s another shot of it against a small portion of the sky that was blue. What a beautiful…and powerful youngster! Great shots. Thank you Tiny! That young one appeared to be very powerful. I pity the smaller birds that may fall prey to it. Thank you! That young eagle did put on a good show and I am lucky most of my shots came out well. These photos are glorious! 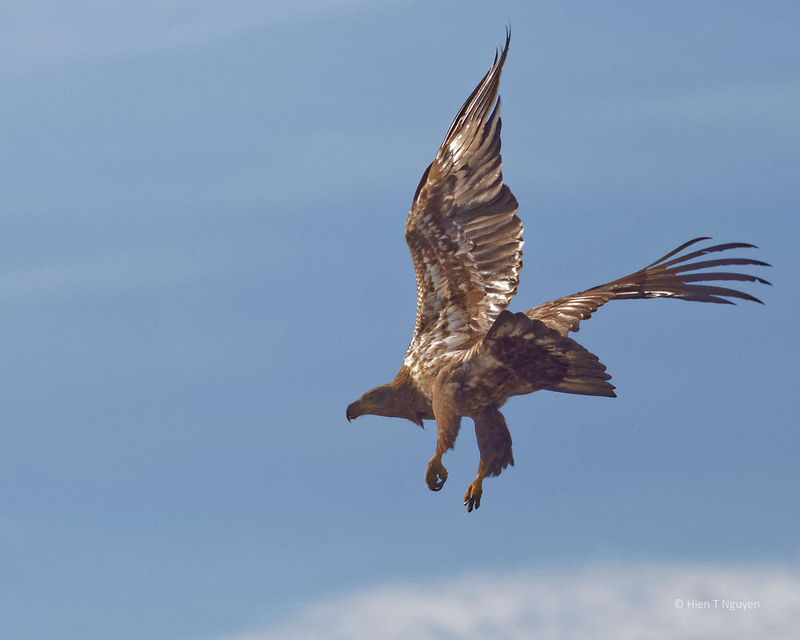 There’s nothing more majestic than a soaring eagle! Well done. A challenging subject. Hien, you’re welcome. Trying to photograph flying birds is a challenge. Most of mine are a throw away. Tim, most of mine are throw-aways too, but once in a while I get lucky. Yes, I hear you load and clear. Thanks. Wow magnificent bird! I love how graceful he looks in flight! Happy Thanksgiving wishes sweetie! Thanks, and Happy Thanksgiving to you and Bear! Beautiful photos, always a source of inspiration! Thanks for sharing your experience and knowledge. Thank you for your kind comments, Mohammad! Great images as usual. I wanted to let you know that I seem to be unable to “like” photos. I can see them and, hopefully, can leave a comment. 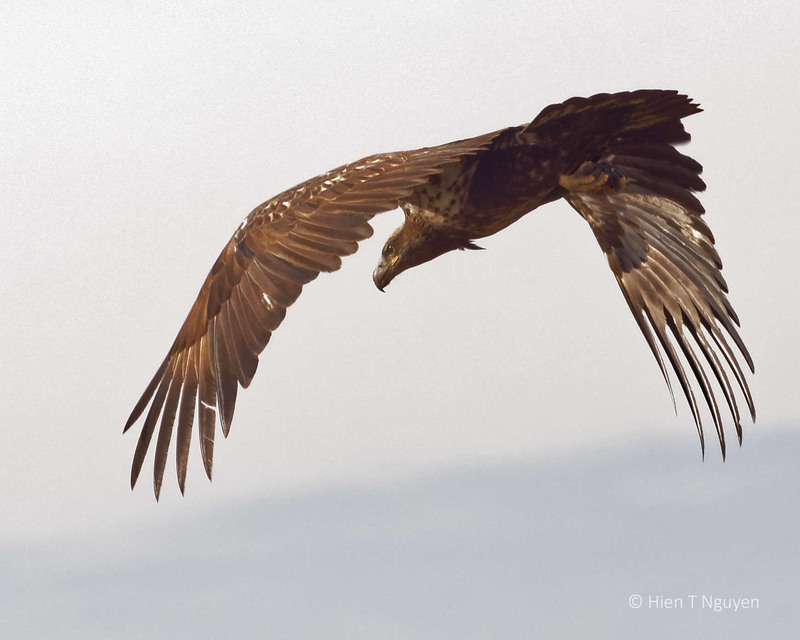 A great series of images of the bald eagle in flight! Obviously he is royalty – he may be young, but he is quite magnificent! When he is fully mature, he will be a regal Bald Eagle. Thank you for commenting, Dries! Beautifully captured, Hien. I love the way you’ve caught the graceful movements. Some great captures, Hien. That last one is terrific! Thank you Eliza! I only wish there was more blue sky. Fantastic series Hen. Aren’t they elegant and graceful in their flight. Wonderful to see the colors so clearly. Amazing photos, Hien. I love the tips of their wings. Thank you Lois. I saw two of these young eagles today. Great shots, Hien. I thought all bald eagles have white head! 😉 Whenever we were traveling on the road, I always looked for bald eagles. Of course I was only looking for white heads. Ha. Helen, thanks for commenting. 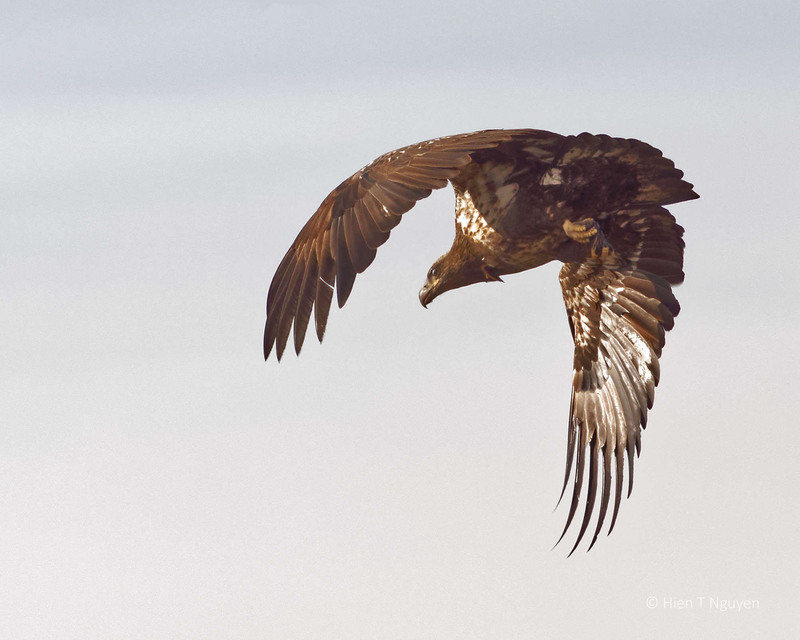 Bald Eagles have fully white heads only when they have reached sexual maturity. 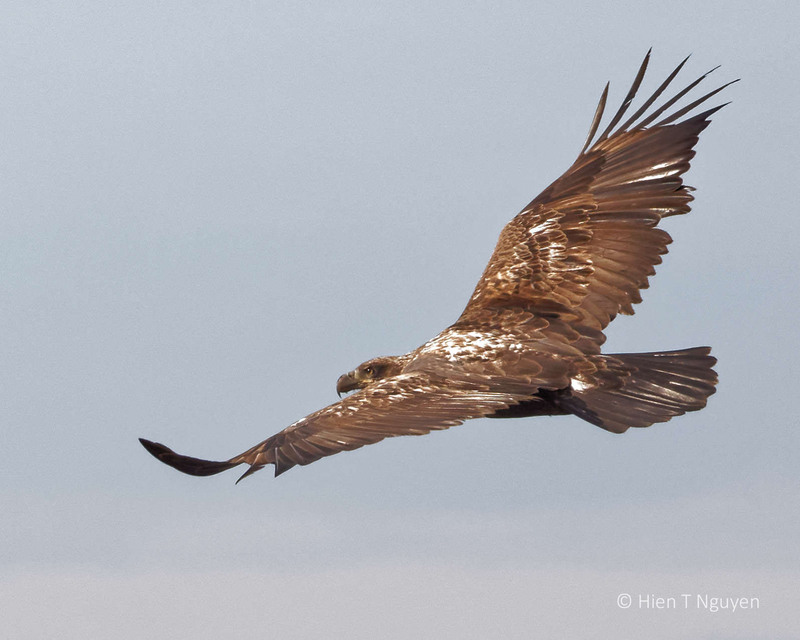 During the first four years they look like this young eagle above, with their heads slowly turning white.